Periorbital or preseptal cellulitis is the inflammation of the eyelids and the other soft tissues outside the orbit. This can be caused by trauma, or by an infected wound or an abscess in the lid. This can also be caused by a stye, conjunctivitis, infected blocked tear duct and insect bite. The most important thing to consider is to differentiate this with orbital cellulits which involves the inflammation of the tissues of the orbit with proptosis and limitations of eye movement. Sometimes it is hard to differentiate the two especially when the eyes are really swollen and it is hard to examine the movement of the eye. We then order a CT scan of the head and the orbits to determine if there is extension in the orbits. 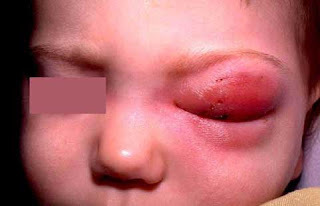 Orbital cellulitis follows a direct infection from a wound, deposition of organisms from the eyelids, conjunctiva, metastatic involvement from a tumor. The most common cause in children is paranasal sinusitis. 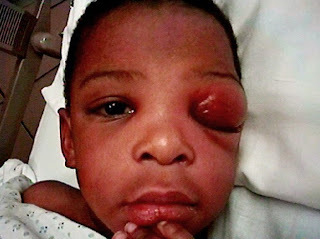 Orbital cellulitis have complications which result in meningitis and cerebral abscess . Prompt hospitalization with intravenous antibiotic therapy and surgical drainage of the infected sinuses are part of the treatment. An expert must identify the need for specific procedure and be responsible for conducting the procedure safely. This Postorbital cellulitis also known as preseptal cellulitis is an inflammation and infection of the eyelid and portions of skin around the eye. We really need to take care of our eyes to prevent this kind of infections. Ehealth of the greatest hurdles is overcoming misconceptions in the minds of regulators, doctors and patients alike. I just returned from a trip to Germany and colleagues there are amused about America's 3rd World-like medical records situation.